This year’s theme at Chocolatier Contance Popp is “high-end Valentine’s,” but Constance assures us that this is not elitist. That is, unless it comes to your palate, as everything that comes out of this St. Boniface shop tastes like a million bucks. Case in point a new item for Valentine’s Day, a chocolate rose (available in multiple shades of colour), which (almost) looks too pretty to eat. Inside the dark chocolate shell, your tastebuds will be met with a caramelly, rosewater-infused white chocolate that is like nothing else you’ll find in the city – it’s just floral enough, being offset by the semi-bitter shell while the creamy texture dissolves in your mouth. These certainly are not your run-of-the-mill creations; a sampling we just had featured some outstanding numbers, including a pink heart air brushed with white x’s that contained strawberry ganache with pink peppercorns. We tried hearts filled with sea salt caramel and marshmallow (which will ruin almost all manner of caramel for you and your loved ones); white chocolate with vanilla cream and a cranberry ganache in a dark chocolate shell; a blue heart filled with blueberry gelée and blueberry ganache; and a yellow, white chocolate shell filled with mango gelée and basil-infused white chocolate ganache that was so unexpected, and so delectable. In total, they will be making several thousand of these hearts in the next week leading up to Valentine’s. It’s the only time of the year where they pre-package boxes of chocolates, which is done to keep service expedient on the busy days leading up to February 14. New to this year is a “Diamond Chocolates are a Gal’s Best Friend” series that is, in the words of Constance, “sparkly and rich and luscious.” These chocolates also feature high-end booze, including a Criollo bean (which is the best chocolate bean you can buy) infused bourbon, Crown Royal Northern Harvest Rye, and a shiraz wine. Other seasonal numbers that you can find right now are the very tongue-in-cheek “Relationship Series,” that come in a traditional looking heart-shaped crimson box replete with a window. 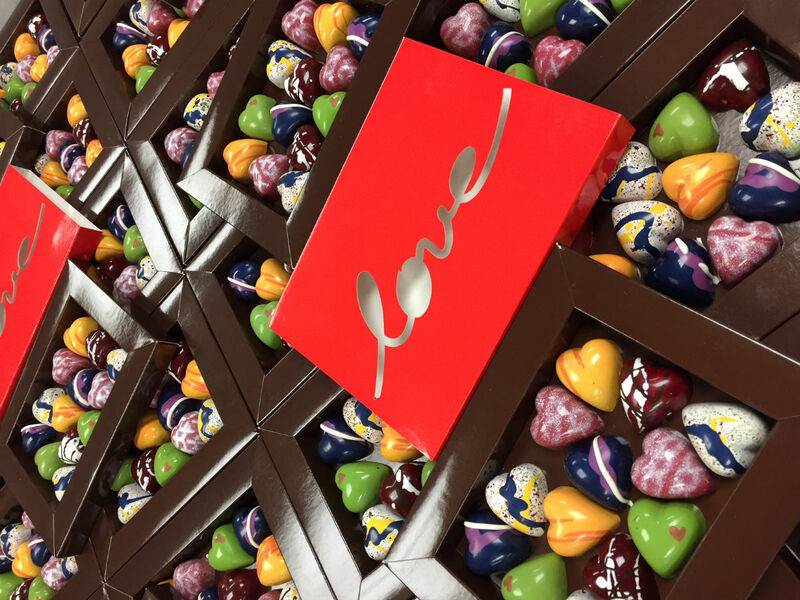 These boxes are filled with various chocolates and truffles with flavours combinations that include vanilla-cranberry, and saffron with passion fruit liqueur. This includes a chocolate to symbolize puppy love – a sweet number filled with a milk chocolate with honey and cream; one that they refer to as “The Mistress” – filled with rum and spices and sealed with a kiss on top; a “drowning in sorrow” truffle – filled with organic blueberries that have been soaked in vodka; and all of this ending perhaps in “perfect love” – a red wine dark chocolate that is a personal favourite of Constance’s. Needless to say, we hope your love life and Valentine’s Day is as sweet and enjoyable – but way less complicated – than this relationship series box. But who are we to judge. Chocolatier Constance Popp is located at 180 Provencher Boulevard, and is open Monday to Friday from 10 a.m. – 6 p.m., Saturday from 10 a.m. – 4 p.m., and will be open on some Sundays in February (11, 18, 25) from 11 a.m. to p.m. Call 204.897.0689 for inquiries or visit their website for pricing and to see more creations.